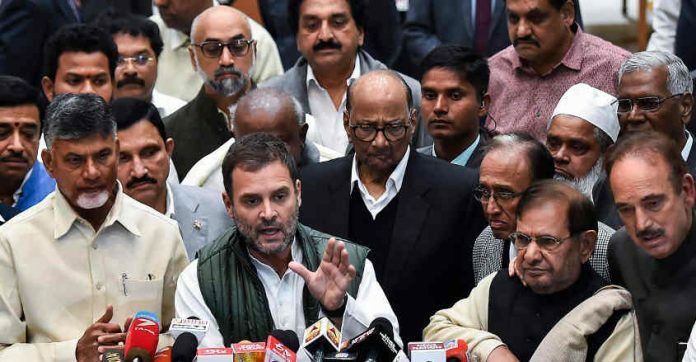 New Delhi : Twenty-one opposition parties Wednesday expressed anguish over what they alleged was “blatant politicisation” of the sacrifices of armed forces and urged the government to take the nation into confidence on all measures to protect India’s sovereignty, unity and integrity. After a meeting in the Parliament Library, the leaders of these parties issued a joint statement, expressing concern over the prevailing security situation in the country. “Anguished over blatant politicisation of sacrifices of armed forces by ruling party. Urge government to take the nation into confidence on all measures to protect India’s sovereignty, unity, integrity. “National security must transcend narrow political consideration,” the joint statement said. The parties also condemned the “dastardly” Pulwama terror attack by “Pakistan-sponsored” terrorists of Jaish-e-Mohammed on February 14. The leaders paid homage to the soldiers killed in the attack and expressed solidarity with the Armed Forces. The statement also said that the prime minister has “regrettably” not convened an all-party meeting as per established practice.